I work every year with John McNeil Studio developing and installing elaborate decoration concepts for their small company holiday party in Oakland. The center piece of the event in 2015 was a flocked and disco-ball adorned Christmas Tree hung upside-down from the ceiling by steel cable. 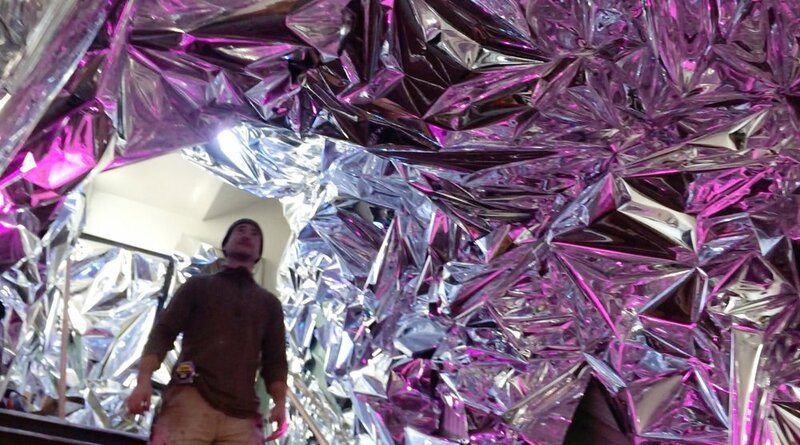 was an immersive installation for guests to experience as they entered the second floor venue through a kaleidoscopic staircase tunnel of reflections. This was a sculptural art installation for the John McNeil Studio Mess party. A welded metal frame held 12 vintage TV screens connected to BrightSign digital playback boxes through HDMI to RCA downconverters. Looping assemblies of vintage advertisements were played back on the 12 screens for the duration of the party.